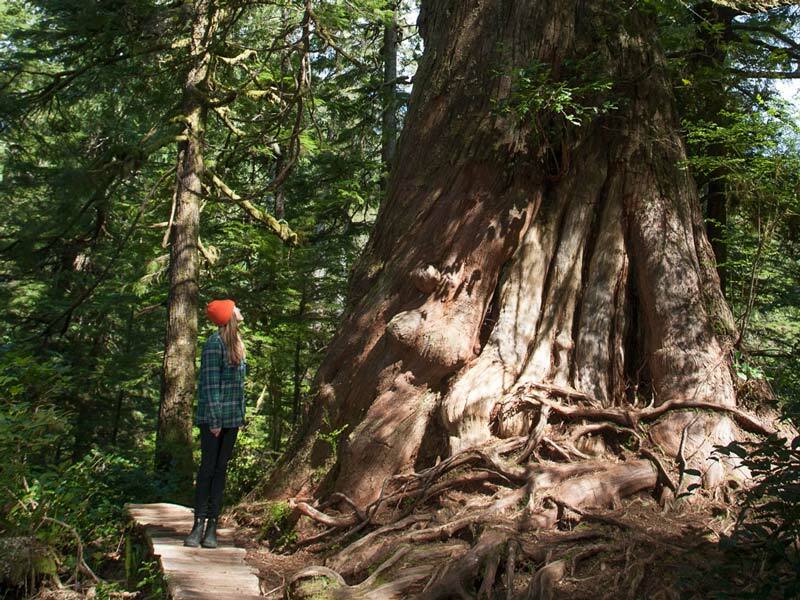 The magnificent back drop to picturesque Tofino Village is the pristine Meares Island, which is home to some of the oldest Red Cedar trees in BC! From Tofino you can take our 10 minute boat cruise to the Big Tree trail head, or 15 minutes to Lone Cone to hike up to the summit for an eagles view of the surrounding area. The Big Tree trail has two parts. The trail begins as a boardwalk leading you past many features of special interest to the Hanging Garden Tree which has a circumference of 18.3 meters and a height of 42.7 meters! The board walk is 620 meters in length and takes approximately 1.5 hours return to enjoy. Depending on the tide, you will begin your journey past many mud flats which are extremely important to migratory birds for rest and feeding on their west coast flying routes. You will then pass between a variety of small islands where the edge of Meares Island lay before you. *Water Taxi Rates are for Return Trips. This 6.5 km return hike would be classified as steep and difficult. The elevation gain is approx. 730 m. The initial 1.2 km is gradual and then you start the steep ascent which averages 45 degrees. Hikers need to allow 5–6 hours pier to pier. The grueling climb is well worth it as you will be rewarded with the most amazing views of our local islands and the open Pacific. All we can say is WOW! At the summit you will have the eagles perspective. This is a demanding hike and you should be prepared with all the gear and clothing you would need for an intense wilderness hike. In the early 80’s, Meares Island was in immediate danger of clear cut logging. Concerned Tofino residents, environmentalists, and the Nuu-chah-nulth First Nations joined together to face off the big timber industry. This initial battle ground gave birth to BC’s “War of the Woods” which spread up to the Queen Charlottes and culminated into the largest act of peaceful disobedience in Canadian history! These trees, aged between 800 and 1,300 years, are something to marvel at. Take your time to explore the fern carpeted forest floor and to hug some of the hugest and oldest life forms on this precious planet. Hilthuu? is the Tla-o-qui-aht place name for Meares Island. Hilthuu? Is a significant part of the Haahuulthii ~ traditional territory, resources, rivers, songs and names of the Tla-o-qui-aht Hawiih ~ Hereditary Chiefs. Add a 40 minute Harbour Tour to your Big Tree Trail taxi for an additional $40 per person. Please call or email us to add the Harbour Tour onto your Meares Island adventure. 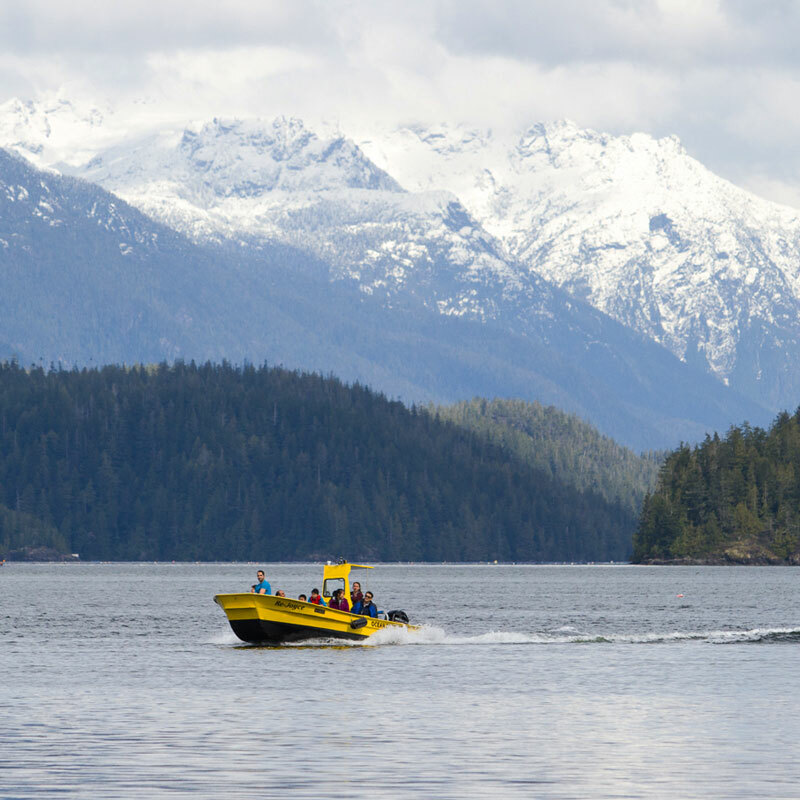 A ecological stewardship fee of $4 will be added to each fare in support of maintaining the marine ecosystem in Clayoquot Sound. Ocean Outfitters donates this amount annually. We are visitors in a wolf and bear habitat. We treat wildlife with respect. Since wolves have been frequenting Meares Island, we no longer permit dogs on the Big Tree Trail nor Lone Cone hikes. Thank you for joining us in honouring and making way for the indigenous inhabitants of the area. We recommend that you pack some food and drinks and dress in appropriate clothing for a wilderness hike (Lone Cone). Keep in mind that our west coast weather can be unpredictable, so come prepared! The trail there and back is approximately 3km. On average, this takes about 1.5 hours to walk. The boat ride over to Meares Island is approx. 10 minutes. What is the Big Tree Trail like? How long does the Lone Cone hike take? How long is the boat ride over to the Lone Cone hike trailhead? Wolves frequent Meares Island, and we do not permit dogs on the Big Tree Trail or the Lone Cone hike. We love dogs but we do not allow dogs on our programs, not even the smallest one’s. We are visitors in a carnivore landscape. Dogs are a proven attractant to wolves. When in wolf, and bear habitat, we must adapt, and be respectful. Want to learn more about Meares Island and the surrounding harbour? Add a 40 min Harbour Tour to your Big Tree Trail taxi for an additional $40 per person. You will get to explore the Tofino harbour and learn about Meares Island and local history. Please call or email us to add the Harbour Tour onto your Meares Island adventure.